Overlooked Nature – Page 2 – Celebrating the scaly, the slimy, and the many-legged. Sorry I’ve been neglecting my blog lately. Life is, and will continue to be for the next couple months, very busy. In lieu of actually writing a post, here’s a fascinating look at the walking shark from the excellent blog Odd Organisms. It’s nighttime on the Great Barrier Reef, and as the tide slips out to sea it uncovers a much tougher environment. Chunks of coral are exposed and only small pools of shallow water remain where there is little oxygen available. Hardly the place you expect to find a shark. But! This is not your ordinary shark (it’s odd organisms for gosh sakes). No, this is an epaulette shark (Hemiscyllium ocellatum). A wriggly, wormy, wonder shark who’s amazing adaptations to it’s complex environment include an incredible tolerance to low oxygen and high CO2 levels, PLUS, the ability to walk across the reef! Walk! So solitary, this is actually a selfie! When I first moved to North Carolina, I didn’t have a place to live lined up. I figured I’d camp out at a park for a few days until I found one. Lucky for me, NC has approximately a bazillion state parks, and I found one nearby with a campground. My concerned friends back in Florida replied that they hoped this was just a temporary situation. It did turn out to be temporary, and a friend who lived in the area called some of her friends, and they offered me a place to stay for a couple of days. Then I finally managed to find someone with a room to rent who didn’t sound creepy and didn’t think I sounded creepy. And after a year of that, I moved into a little house all by myself, and I still live there. So, this photo? This is not home. This is just the spot where I was camping this weekend. For fun. And it didn’t even rain! I recently lost a large chunk of the contents of my hard drive, including many of the photos I intended to use for this blog. Most of them still exist, scattered over an old hard drive, several thumb drives, and at least three camera cards. My files were backed up, but not organized. I’ve been slowly going through them all, occasionally finding something I forgot I had. Like this video version of the Spider vs. Anole photo! This is probably the worst photo I will ever post. And the best. Most of my wildlife photos came from one job. That job, in spite of allowing me a lot of time and access to wander around taking pictures, did have a goal: to find and document flatwoods salamanders on two state forests. It had recently been discovered that the flatwoods salamander is actually two species, so recently that the current Petersen Field Guide to Reptiles and Amphibians still lists them as one species: Ambystoma cingulatum. A few years before I started the job, the populations west of the Apalachicola River were declared a separate species, the reticulated flatwoods salamander (Ambystoma bishopi). They were already rare as one species; this little offshoot was extremely rare. There were only about 36 known ponds where they had been found, and at many of those, none had been seen in years. Flatwoods salamanders have a clever but risky reproductive strategy, which in rainy years gives them a big advantage, but in dry years means complete failure. They rely on the cold fronts that come through the Florida panhandle, bringing rain more or less regularly throughout the fall and winter. On rainy nights in late fall, flatwoods salamanders come out of their burrows and make their way to ephemeral ponds, which are just shallow depressions in the woods. These aren’t really ponds yet, but they will be, if the rain keeps coming. Flatwoods salamanders lay their eggs before the ponds fill. This gives them a head start, so by the time other salamanders and dragonfly larvae are swimming around, the flatwoods salamanders are too big for them to eat. Salamander eggs have no shells. They need a thick cover of grass and weeds to protect them from desiccation. So there’s another thing they need for good habitat: plants need sunlight. Which means the forest canopy can’t be completely closed, and the shrubs and small trees can’t be too thick. Luckily, the natural state of pine forests in Florida is open and grassy. Florida’s ecosystems evolved with frequent fires, started by both lightning and humans. As a result, outside of wetlands, the natural plant life is either tolerant of or actually dependent on fire. The major tree of the uplands is the longleaf pine, a tree that is perfectly adapted to fire, as long as the fire is near the ground. It’s also adapted to keep fire on the ground: there are no low branches to help the flames spread up to the crown, and the mature trees are naturally spaced far apart, so even if one is engulfed, the ones around it won’t burn, too. This has the bonus effect of letting sunlight reach the ground, which lets plenty of (fire-tolerant) grass grow, which lets the fire spread out along the ground and kill the competition. Unfortunately, very little of the forest is still in its natural state. The problem with much of it, and this will sound ridiculous when talking about a forest, is that it has too many trees. Not enough sunlight reaches the ground for grass to grow, and animals that depend on the grass have nowhere to hide or nothing to eat. I sought out the grassiest, most open ponds, but in four years of trying, I never found a flatwoods salamander on the forests I surveyed. Three of the four winters were too dry for many of the ponds to fill in the first place, and those that did dried within a few weeks. Not long enough for a salamander to go from egg to adult. I did catch other animals: mole and dwarf salamanders; newts; cricket, leopard, little grass, and ornate chorus frogs; Southern and oak toads, Eastern spadefoots; garter snakes and pigmy rattlesnakes. At the end of every season, I would start out my report by stating that I had not found any flatwoods salamanders, and then describing all the animals I did find. Even though it was fun, it was also kind of depressing. How many drought years in a row could a population survive? Was I just missing them, or were they just not there? Were they extinct on both my sites? I’d asked my counterparts on other sites if they had found any, and they had not. Had the reticulated flatwoods salamander gone extinct almost as soon as it was discovered? One rainy night, I was asked to help set traps around a little pond on Eglin Air Force Base. This was the pond where the last known reticulated flatwoods salamanders had been caught. But the previous fall had been another drought year, and the researchers there had had no luck. Still, if there were flatwoods salamanders in the area, this was the best chance I had to see one. I drove out there after work, met the young grad student who was trapping them. Drift fence, partially encircling a pond. The traps are hung up when not in use. Their methods were different from ours. We had partially circled 20 ponds with our fences, and along each fence we placed six traps: on each side, one at each end and one in the center. On non-trapping nights, an animal could just follow the fence to the end and then be on its way. We could leave our partial fences up all season, but this meant we only ever caught the fraction of animals that ran into the fence on their way in or out of the pond. Because these researchers had only one pond to deal with, they completely surrounded it with a silt fence, leaving gaps here and there that they closed on trapping nights. They had dozens of traps along this fence. This meant we would catch every single animal coming in or out of the pond. If salamanders were moving tonight, we would catch them. The student and I closed up the gaps and set our traps along it in the rain. Then we waited an hour in the truck. After an hour we went and checked them. We only had a cricket frog. I shook it out of the trap on the other side of the fence. We went back to the truck and sat and waited some more. The second time around, I picked up my first trap and saw something dark moving in the corner. I maneuvered it around and finally just reached in and took it out. It looked a bit like the mole salamanders I’d been catching all this time, but not enough to mistake it for one. Longer, thinner, with net-like markings instead of dots. And slippery! I almost dropped it before the grad student could get out his ruler and measure it. The next trap had one, too. And the next. We caught more than twenty that night. Not only were they not extinct, but it looked like there were enough to keep the population alive at least another year. My photo is blurry, because it was dark and raining and the salamander was slimy. But, look: Ambystoma bishopi lives! Posted on February 29, 2016 June 29, 2017 Author Bethany HarveyCategories Amphibians, Nature, WildlifeTags endangered species, featured creature, field work, Florida, herpetology, herps, longform, natural history, salamanders3 Comments on This is probably the worst photo I will ever post. And the best. In the comments for last week’s cricket frog post, I mentioned that the cricket frog was not the smallest frog in Florida. 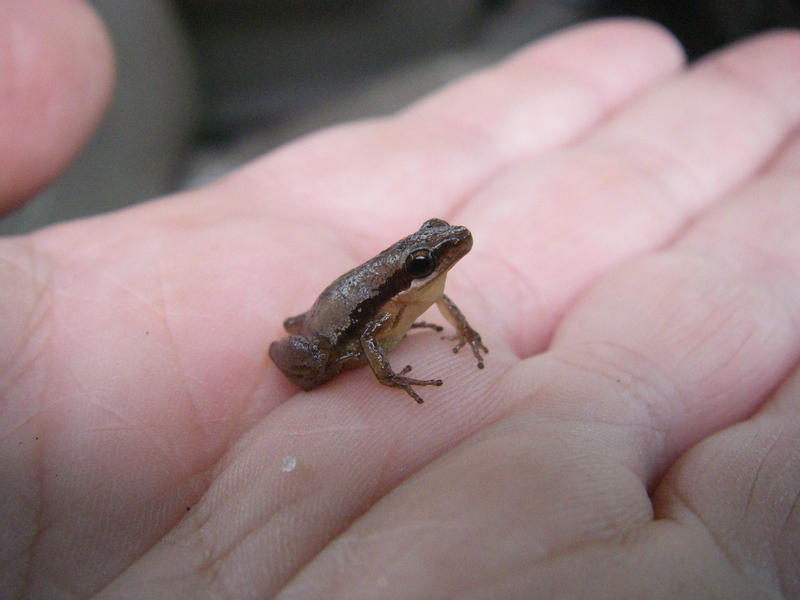 Then, I completely neglected to say what the smallest frog was. So, here it is: the little grass frog. 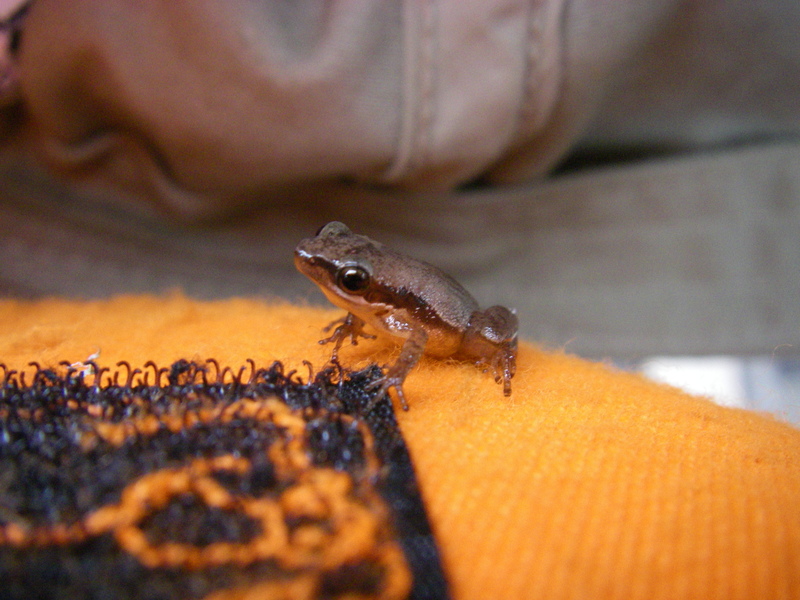 It’s related to the spring peeper, in the Pseudacris genus. Little grass frog, on velcro. Little grass frog, on hand. The little grass frog is another amphibian that breeds in ephemeral ponds, as well as other grassy-edged bodies of water. I’ve only ever seen two, and I spent a great deal of time in their habitat. It’s not particularly rare; it’s just very hard to see. Put this little guy in some dead grass, and he would disappear. These, like literally hundreds of mole salamanders, ornate chorus frogs, and leopard frogs, were captured in an attempt to catch flatwoods salamanders (more about those next week). I’ve never seen one just hopping around on the ground. If you do, what luck! Take a picture. Preferably with an object for scale, because nobody will comprehend just how tiny it is without one. Go to a pond in the southeast and walk along the muddy edge, and you’ll likely see tiny frogs leaping into the water ahead of you. You’ll rarely see the frog beforehand; the first hint of its existence will be a little splash. They launch themselves many times their body length, springing from the weeds into the water as if assisted by wings. From the opposite side of the pond, you’ll hear repeated clicks, like stones being struck together. If you can find one sitting still long enough to get a good look, you’ll see that it’s about an inch long: a slender, long-legged creature, with bumpy skin and a triangle on the back of its head. It will be some combination of brown, black, green, and gold. There are two species of cricket frogs: northern and southern. The northern species has slightly longer legs and a slightly more rounded snout, but they are otherwise very similar. They sometimes interbreed where their ranges overlap. (Those shown in this post are the southern species or hybrids of the two.) Between the two species, they cover most of the eastern half of the US. The breeding season depends on the local climate; in Florida they may breed year-round, while in the northern edge of their range it’s limited to spring. Adults eat insects and spiders, while the tadpoles are vegetarians and feed on algae. The tadpoles are actually longer than the adults, if you include their tails, which are long, transparent, and often black-tipped. The black tip may be useful in confusing predators into grabbing for the tail instead of the body. This is good, because cricket frog tadpoles are eaten by just about everything else in the water — dragonfly larvae, salamanders, fish, snakes, other frogs… The lucky tadpoles which survive can take anywhere from 4 to 12 weeks to metamorphose into adults. Bright, vibrant colors in winter can be hard to find, but sometimes all you have to do is look up.